A strategy that, in the case of internationalization, was launched in 2006 and strengthened in 2008 as a result of the economical crisis. “The key was to find those emerging markets that were in disposition to buy and in which a previous work had been done,” says Iñigo Béjar, founding partner and CEO of the company. The process culminated in 2010 with the opening of a commercial office in China, an important piece in the growth of E & M Combustion. “During the period 2008-2015 we have verified that internationalization is the way and a proof of this is that companies positioned in the international market have been able to better withstand the impact of the crisis”, acknowledges Béjar. The process went further in 2016 with the opening of a commercial office in India, which is already providing a very positive response. “Our international experience has been very intense and succesful, which allows us to have close to 70% of our market abroad and have a presence in more than 30 countries. In addition, in recent months we have entered some of the Asian region and the Middle East countries, with a good offer of innovative combustion technologies, competing with companies from all over the world. 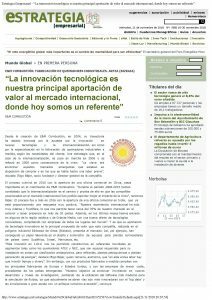 ” And is that its contribution of innovative technology is the main value proposition that this company, based in the industrial site of Bildosola, Artea (Spain), presents to the market. Thus, for example, they have achieved a relevant role in the design and supply of equipment for solar thermal power plants in countries such as South Africa, Israel, Morocco, etc. 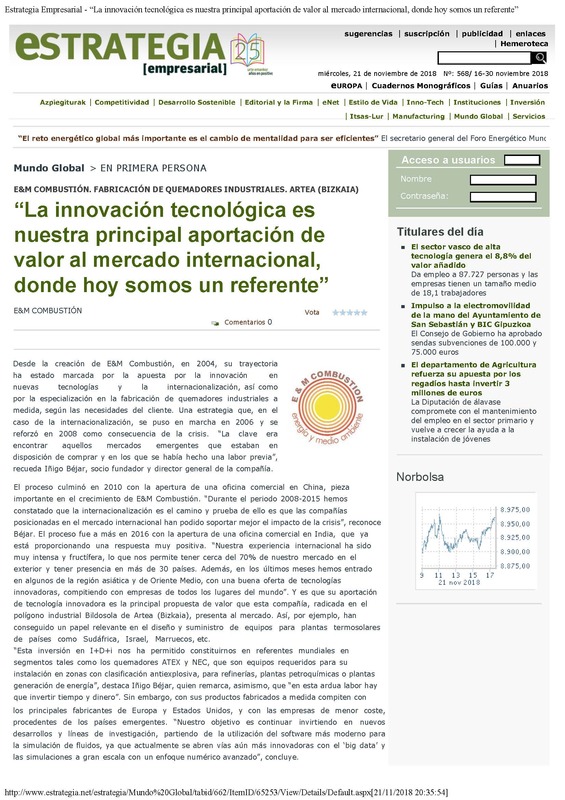 “This investment in R & D & I has allowed us to become world´s leaders in segments such as the ATEX and NEC burners, which are required equipment for installation in zones with anti-explosive classification, for refineries, petrochemical plants or power generation plants”, points out Iñigo Béjar, who also points out that “in this arduous task we must invest time and money”. However, with their tailor-made products they compete with the main manufacturers in Europe and the United States, and with the lowest cost companies, from emerging countries. “Our objective is to continue investing in new developments and lines of research, based on the use of the most modern software for fluid simulation, since currently even more innovative ways are opened with ‘big data’ and large-scale simulations with an advanced numerical approach. This will allow us to continue being a reference in technological innovation in combustion “concludes.